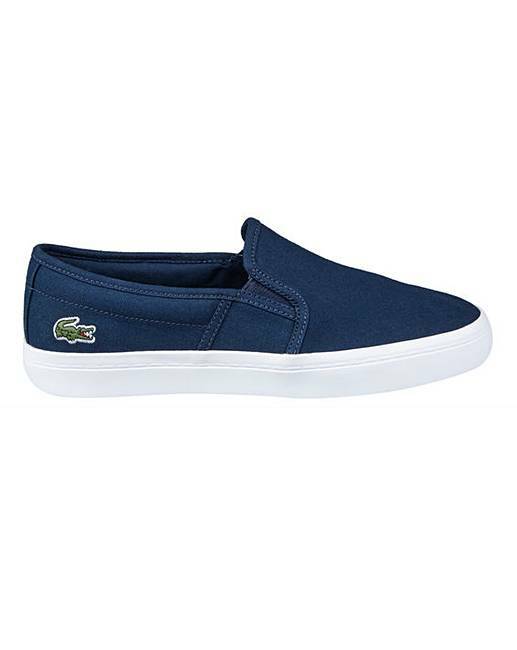 Lacoste Gazon Slip On Trainers is rated 4.3 out of 5 by 3. The Gazon slip-on trainers re-imagine René Lacoste's pared-back court style with fashion-inspired details. A hidden elastic side section makes for a comfortable fit, while subtle branding finishes this seasonal must-have. Rated 3 out of 5 by willow from good looking trainer bought these for holiday, not very comfortable, the shoe bed is very hard on your feet, needed to put in extra insole. quite tight fitting, go up a size if you want to wear socks. Rated 5 out of 5 by Chlo92 from Lacoste slip ons I bought these in both colours, having bought the white ones for my holiday I washed them on return and they didn't wash well there must be yellow glue around the sole which has turned the full shoes yellow. But they are really comfy and now i cant wear the white ones so I went ahead and bought the navy ones too!